The Incline Village Recreation Center – operated by the Incline Village General Improvement District (IVGID) – includes an indoor pool, group fitness classes, a cardiovascular room with an adjacent gymnasium, a massage room, coed sauna, and a complete selection of programs and equipment for you and your family to enjoy. All facilities and programs are open to the public, with discounts offered to Incline Village residents. The Incline Village Tennis Center (Season runs May - October) offers 11 tennis courts and 8 pickleball courts that are open to the public and located in a picturesque alpine setting along a year round creek with a fully stocked Pro Shop, located right next to the Recreation Center. Weekly socials and tennis mixers are offered throughout the summer months, attracting locals and tourists alike. Our professional and friendly staff is available to arrange your next game, find you a perfect hitting partner or answer any racquet, stringing or tennis/pickleball gear questions you may have. The Tennis Center Pro Shop offers a full line of Babolat and Volkl rackets, pickleball paddles, Nike and Tail apparel and shoes, professional racket stringing, and demo rackets and paddles available for use by guests without their own rackets with them or looking to try something new. Taught by USPTA certified instructors, adult private, semi-private and group lessons are available all season long. The Tennis Center also offers beginners clinics, adult boot camps, and doubles warm-up drills clinics. Recurring and special events include daily adult cardio & skills clinics, Monday Night mixed doubles play, Tuesday Ladies’ Day Round-Robin play, Thursday Men’s Day Round-Robin play, and tournaments. The Incline Village Tennis Center specializes in kids programming too, with $3 afternoon court fees for kids 12 & under (FREE for IVGID Picture Pass Holders), youth and junior classes for ages 3+, USTA Quick Start Youth Tennis Camps, and a competitive Junior Tennis Academy. The IVGID Parks & Recreation Department also maintains a disc golf course, skate park, community gathering spaces as well as numerous ball fields and trails throughout the Incline Village community. 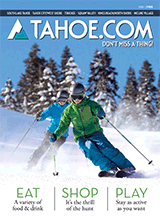 Find more information on all these amenities at YourTahoePlace.com.